Porsche took the entire gleam at the Frankfurt Motor Show 2015 by introducing its Carrera 4 model. Not only was this but there we have another one from the company. 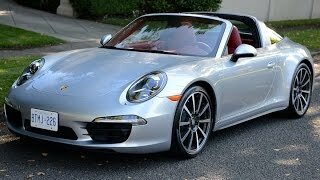 We are talking about the Porsche 911 Targa 4 2016. Housed with more power beneath its stunning body, the model offers lot of tech features to keep you in limelight. Let us have a look at each of them through the review of Porsche 911 Targa 4 2016 and get to know the model better. The interior of Porsche 911 Targa 4 2016 isn’t just comfortable and gorgeous but has been created to deliver better performance. Buyers will get the new PCM infotainment system through a seven-inch multi touch display. There is also a navigation system that will accept your hand-written inputs with a year’s free subscription for the Google Street View, Real Time Traffic Info, remote vehicle data retrieval and internet radio. The steering wheel too gets a new design which resembles to the one we saw in 918 Spyder. The model offers an electro-hydraulic lift feature that enhances the ground clearance by 1.57 inches and thus making your ride a better experience and the bottom of car safe, without any scratches. Last but not the least before we conclude the interior details of Porsche 911 Targa 4 2016 is the Smartphone Connectivity that comes with Wi-Fi, Bluetooth or hardwire connection support. With the exterior design of Porsche 911 Targa 4 2016 company has proved that they have brains with numerous design options working to create their models. Starting with the front fascia, you’ll notice a redesigned bumper which has smoother looking air-intakes while the oval shaped headlights now offer house to the slimmer four-point daytime running lights. Moving towards the rear fascia the door handles will hold your vision for a while through the recess covers which now feature decent look while the rear end has a trunk lid with vertical louvers eliminating the horizontal design. Beneath the setup is a pair is newly design four point taillights that get connected to each other with a thin light strip. In all concluding the exterior details of Porsche 911 Targa 4 2016 I would say the open roof, tech features and comfort together will undoubtedly make your experience beyond comparison. Beneath the hood of Porsche 911 Targa 4 2016 is a 3.0 Liter RWD six-cylinder engine cranking total output of 370 hp and peak torque of 450 nm paired to seven-speed manual transmission with an option to have a seven-speed dual-clutch PDK transmission. With this power rumbling the streets, the top speed of Porsche 911 Targa 4 2016 touches the mark of 179 mph while the 0-6 mph sprint can be knocked in 4.3 seconds.